Barcelona make approach for one of Chelsea's title winning defenders. According to various reports, Barcelona have made an approach to the Chelsea board over the availability of Cesar Azpilicueta. You have to admit that it's worrying times if there is real substance in these reports. "Dave" played every single minute of every single Premier League game for Chelsea last season and played an instrumental part in winning the title for our fifth time in twelve seasons, second time in three seasons. Having signed for Chelsea back in 2012 for a fee of just £7m, it's fair to say that he has been outstanding every single year he has worn Chelsea blue and has shown his flexibility to adapt to new positions when asked of him without problems. Jose Mourinho was quoted as saying once "I wish I had eleven Cesar Azpilicueta's in my team" which if anything, says it all of the players attitude and his defensive abilities. Jamie Carragher and Gary Neville have both stated that he is the best defender one-on-one in our game which again, this time from ex-professionals who have won it all tells you just how highly he is rated by people outside of our club. So to Barcelona. It's seems that their new Manager Ernesto Valverde has identified one of their main weaknesses as he prepared to take control next season being their defence. Rumour has it that he has made Cesar Azpilicueta his number one transfer target this summer with Arsenal's Hector Bellerin as an alternative if Chelsea indicate that they have no intention of selling the versatile defender. "Dave" has been outstanding this season playing on the right-hand side of our back three considering I was personally worried that he would be too small to play as an effective centre-back in this league. He has made the position his own working in tandem with David Luiz and Gary Cahill and more importantly with Victor Moses down our right hand side. Moses himself has praised Azpi for coaching him throughout the season and helping him with the defensive side of his game. Let's also not forget that "Dave" was also instrumental in the demise of Ashley Cole at Chelsea through nothing but his defensive ability and consistent performances when he made the switch from right back to left back by Jose Mourinho. He played so well that Cole couldn't get back into the team and subsequently left the club. 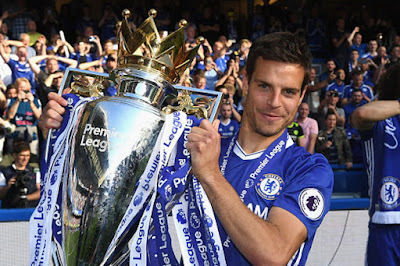 Chelsea have Cesar Azpilicueta tied down to a long-term contract to the end of 2020 and it would take (you have to believe) a huge amount of money to convince Chelsea to sell if the player indicated that he wanted to leave. The thing is, I cannot see him leaving the club as he has spoken of being settled and loving life in London. I sincerely hope that the Catalan side turn their attentions to North London and "Dave" stays here. He remains an important part of our solid foundation that we need to build on this summer as we look to make a real challenge for the UEFA Champions League in addition to the Premier League next season. Article Sources: The Sun / Daily Mail.